It all took place in the trenches…..and it all ended in the end zone. Coming of their back to back losses for the first time since Kaep and Harbaugh took the reigns, the Niners were in need of a big win. Well, they got that done and showed what kind of team they truly are. They got back to their style of dominant defense, but what did the offense show us? In the win against the Rams, the Niners got back to their tried-and -true game plan of giving their HOF back the ball. Between the four running backs used in the game, there was a total of 40 carries. LaMichael James made his season debut with three carries that didn’t amount to any yards. Anthony Dixon got in with three carries of his own, only gaining a total of six yards but did record a touchdown. Now we get to the feature backs. 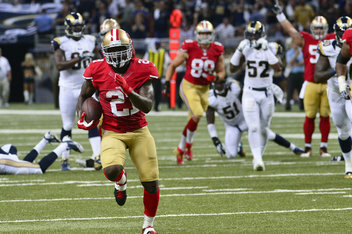 Kendall Hunter and Frank Gore combined for 31 carries. Hunter ended with 11 carries for 49 yards and one touchdown. The change of pace back kept the defense honest on the outside. This allowed Gore to do what he does best. Gore got plenty of carries up the gut, which is his specialty. Gore totaled 20 carries and broke the century-and-a-half mark with 153 yards and one touchdown. He put his great vision on display for all of the Thursday night viewers and let them know he still has the speed and the power that some may have questioned. He showed he is still a top-tier running back in the league and he was recognized for his performance. When you run the ball, you open up the passing game. Simple enough. Colin Kaepernick made a reappearance in the QBR leader board this week. Though there is still plenty of work to be done, this was a good resurgence game for Kaep and his receivers. Kaep totaled 163 yards with two touchdowns and no picks. These numbers are by no means outstanding but after throwing more picks than touchdowns’s in the last two games, its nice to see a zero in that INT category. 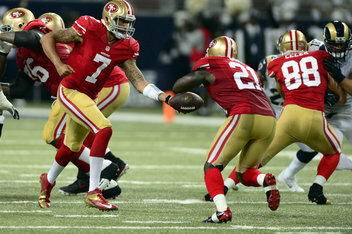 Kaep spread the ball around to seven different targets including his newest target, Jon Baldwin, who recorded two receptions for 19 yards. He could be a big factor down the road. Watch for it. Anquan Boldin also was able to make a difference in this game. He ended with five receptions for 90 yards and one touchdown. The Show will need this kind of performance from Boldin all year long. Side-note: he had one of the prettiest scoring dives I have seen. Even the Injured Vernon Davis ended up suiting up and making a difference for the squad with one receiving touchdown of his own, (which was much needed because I took that risk and gave him the start on my fantasy team, thanks bud). The problem here is that no other receiver besides Boldin and Bruce Miller (22 yards) had over 20 yards receiving. This needs to change. It has to if the Niners want their offense to be seen as an equal threat. Right now it is too easy to game plan against the Niners. Stop the run and man up the receivers. Of course this isn’t as easy as that but it has still happened twice this year. Hopefully with the emergence of Baldwin and Boldin and the health of Davis looking up, The Show can eliminate the consensus that they can’t throw the ball (which seemed to be eliminated in the Packers game but that buzz ended rather quick). With needed improvements aside, the Niners got the W they needed. Though it was against a less than stellar St. Louis Rams team, it was a good game to get back on track. Now they have a true test this Sunday at the Stick against that loaded Texans team. Back to work boys. I’ll see you there. And just incase you missed it (if you did I don’t know why or how), here is that beautiful touchdown dive by Q.